I RECENTLY SPOKE WITH A VERY SWEET WOMAN BY THE NAME OF BECKY HOLLEMAN OUT OF KINSTON, N.C. AND SHE SHARED SOME NEWS FOR ME. 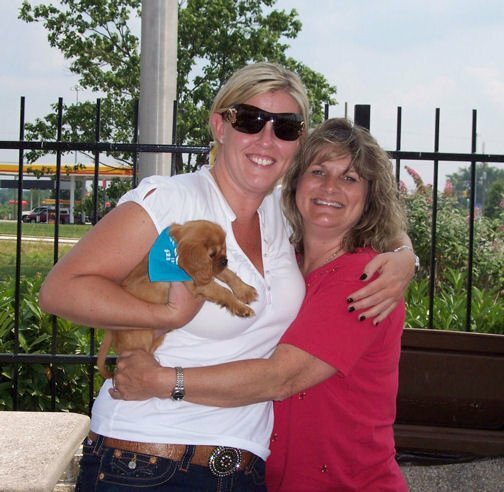 MRS. HOLLEMAN IS A VERY FRIENDLY, ETHICAL BREEDER OF GORGEOUS, HEALTHY, LOVING CHAMPION PEDIGREE CAVALIER KING CHARLES SPANIELS AND LITTLE DID SHE KNOW THAT ONE DAY SHE WOULD ACTUALLY HAVE "NATURE BOY" RIC FLAIR AS A BUYER. 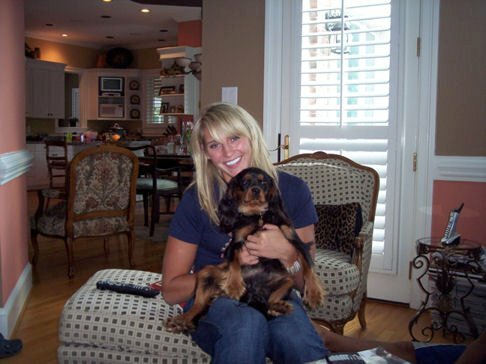 I SEEN ON MRS. HOLLEMAN'S WEBSITE SOME PICTURES OF HER AND RIC AND TIFFANY FLAIR AND I HAD TO FIND OUT MORE, SO I CONTACTED MRS. HOLLEMAN AND SHE TOLD ME A WONDERFUL STORY OF HOW RIC AND HIS WIFE CONTACTED HER ABOUT BUYING SOME OF HER CAVALIER KING CHARLES SPANIELS. MRS. HOLLEMAN WAS ALSO KIND ENOUGH TO LET ME USE HER PICTURES FOR THIS WEBSITE AND I WOULD LIKE TO SHARE THEM WITH YOU. I WOULD LIKE TO THANK MRS. HOLLEMAN FOR BEING SO KIND TO ME AND FOR LETTING ME USE THESE PICTURES FOR MY WEBSITE, AND IF THEY ARE ANYBODY OUT THERE WHO MIGHT BE INTERESTED IN BUYING SOME OF THE MOST BEAUTIFUL LOVING PUPPIES I HAVE EVER SEEN THEN PLEASE VISIT MRS. HOLLEMAN'S WEBSITE AT THIS LINK http://www.kingstoncavaliers.com/ AND YOU CAN CONTACT HER THERE. THE PICTURES BELOW ARE OF MRS. HOLLEMAN, RIC FLAIR AND HIS WIFE TIFFANY, RIC'S DAUGHTER ASHLEY AND MEGAN SO I HOPE YOU ENJOY THEM. THANKS AGAIN BECKY!! WOOOOOOO!!! 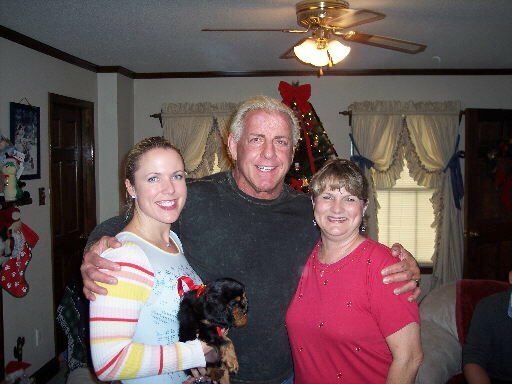 MRS. HOLLEMAN WITH RIC AND TIFFANY FLAIR, THE PUPPY THAT TIFFANY IS HOLDING IS A CHRISTMAS GIFT THAT RIC BOUGHT FOR HIS YOUNGEST DAUGHTER ASHLEY. RIC WITH TIFFANY AND BECKY FROM JULY OF THIS YEAR, THE PUPPY RIC IS HOLDING IS ONE HE BOUGHT FOR HIMSELF AND HE NAMED IT "NAITCH"
RIC'S YOUNGEST DAUGHTER ASHLEY WITH LOUIE! RIC'S OLDEST DAUGHTER MEGAN WITH A RUBY MALE SHE PURCHASED FROM BECKY, AND TIFFANY FLAIR WITH HER CHIHUAHUA.